This week in Breakdown, I want to take a look at the unique situation we have this year with Ryan Villopoto and Ken Roczen. Last fall, Roczen announced that he was joining up with the renowned trainer Aldon Baker, which meant he would be working side-by-side with Ryan Villopoto. This surprised a lot of people. Many consider Roczen to be in the next group of championship contenders and Villopoto was taking a gamble by letting that kind of talent enter his inner circle. 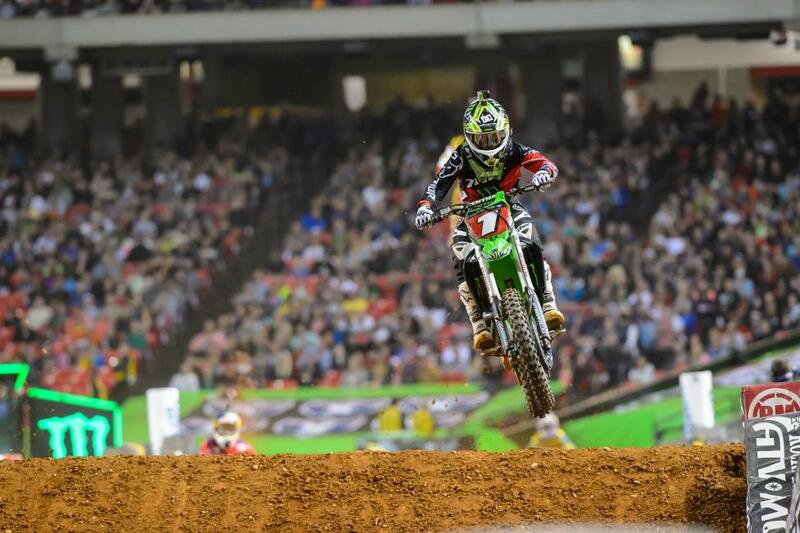 Villopoto explained the move by saying he needed someone to push him to the next level during the week. Also, racing at the highest levels is very serious and RV felt that Roczen's lighthearted attitude could help keep things fun. Ryan is a very confident individual and deep down I don't think he believed Kenny would challenge him right away, anyhow. After eight rounds, Kenny and Ryan have to be considered the favorites for this title. Ryan leads by only nine points, with nine rounds remaining. This title really is up for grabs. Since the checkered flag flew at Anaheim 1, the same question keeps getting asked: Did Villopoto make a mistake by allowing Kenny to join the program? Kenny proved that he was ready for the big time and showed up at round two with the red plate. I don't think this worried Villopoto, however, because a 17-round series usually presents many highs and lows. Experience usually wins out in long championships and RV has that in spades to go along with his three titles in a row. But, so far, the rookie hasn’t made many mistakes. So if Roczen continues to stay strong, will that feeling change? That’s now the big question on everyone's minds. Can these two keep the status quo? Can two riders battling for the most prestigious championship in the off-road motorcycle world also train, ride and spend downtime together? With dreams and ambitions, not to mention millions of dollars at stake, these two will be practicing every day side by side. They have been put in a position to constantly judge each other’s psyche, look for weaknesses and find edges to exploit. It’s a situation that I don't think we’ve ever seen at this level of the sport. It’s usually just too difficult to keep egos and jealousy contained enough to be viable. If these two remain close in the points, I am very intrigued to see if this dynamic will evolve. As the pressure mounts and both see the end nearing, can cooler heads prevail? And don’t forget, as soon as Monster Energy Supercross ends, a new journey begins for 12 rounds of the Lucas Oil Pro Motocross Championship. It would be an incredible display of respect and professionalism if they can make it work. Another question I have been asking myself: Who would Villopoto rather battle for this title? Would he rather duel weekly with someone he trains with, or would he rather battle someone like Ryan Dungey or James Stewart? These two riders are not involved in his inner circle so he doesn’t know as much about their daily preparation, strengths and weaknesses. This also works in the other direction in that Roczen knows the in's and out's of RV's program. Roczen has the advantage of knowing if RV is feeling down or has a nagging injury, or is struggling with bike setup or any other issues. 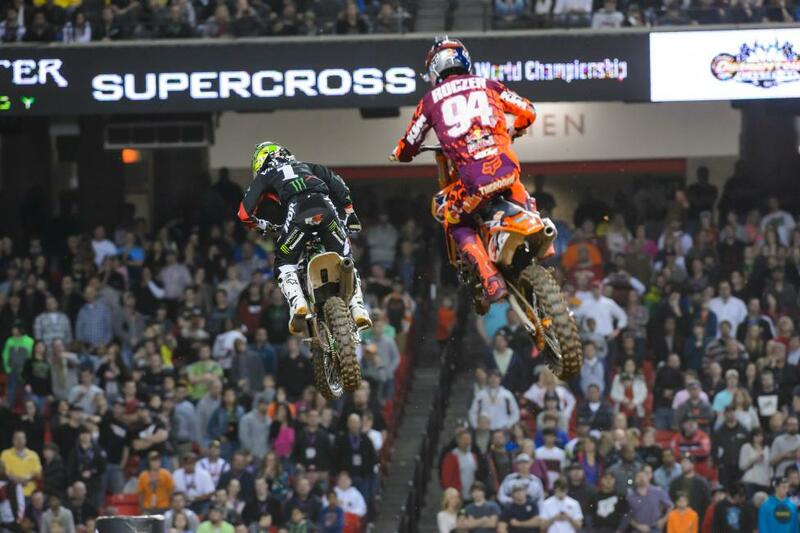 Riders like Stewart and Dungey would be in the dark on details like that. It's an interesting question that I really can't answer, but love to consider. At the halfway point, no one is shocked that Villopoto has the red plate. Many might be surprised that he has only won two races thus far, though. Even more would be surprised that his biggest threat to a fourth title would be his training partner and a rookie. With Chad Reed out due to injury, James Stewart handing over a ton of points last weekend, Justin Barcia's struggles and Ryan Dungey's DNF at Anaheim 3, Roczen and Villopoto might be left to settle this between themselves. On Saturdays, we get to see them lay it on the line for the points and glory, but everyday during the week for the next two-and-a-half months they will be having a silent battle for confidence. Most riders engage in a "cold war" on the weekends. They don't speak to each other and they don't acknowledge each other, they basically just let their riding do the talking. For RV and KRoc, that’s not possible. On every bicycle ride, in every 20 lap moto, on every sprint, in every rowing session, they will be silently watching each other and taking mental notes. They will then show up on Saturday and the outcome will be real … And we will all be watching.